I have written and published this series in four instalments over the space of four years, but it is, in the end, best seen as a single work. As the number of internal references will show, the different strands of argument are interdependent, and they work together to create a total vision. I am trying to create philosophy as though psychology mattered, and you will see that better after the later volumes, not just the first. I am also trying to treat psychology in a way that is thoroughly ethical and epistemological, not constrained by the conventions of the false moral neutrality often found in scientific discussion: but to appreciate this fully you need to read the later more psychological sections in conjunction with the more philosophical ones. Above all, the vision is one driven by practical applicability in different interdependent areas: psychological, spiritual, artistic, social, and political; desire, meaning and belief. You will also see that practical interdependence much better if you read this work as a whole. For all these reasons, I wanted to create a single book that would encourage people to read and refer to it as a whole. This is primarily an academic book (though a rather unorthodox one), and I can appreciate that some may find it initially daunting. Most will be better starting off with my introductory books ‘Migglism’ and ‘Truth on the Edge’. However, I would encourage those who have read these introductions to move onto the greater detail found in this one, because to work adequately with the Middle Way we need to start engaging with some of its complexity. I have tried to make it easier to engage with by providing the running headers, the glossaries, and the tables in the fourth volume. You will also find further supporting resources (including audio talks) on www.middlewaysociety.org. This book also does not necessarily have to be read as a whole, and could also be dipped into or read in a variety of ways in a variety of orders. For example, if you are more interested in the psychology of cognitive biases you might like to start with volume four and then work backwards, or if your background is more artistic you might find it better to start with volume three. 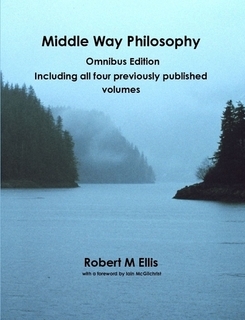 However, wherever you start, it’s important to move outwards to engage with other aspects of Middle way Philosophy. It is a synthetic process. This is my attempt at Middle Way Philosophy, but by no means the last word. I hope and expect that others will in future surpass what lies here, correct its errors, and improve on its limitations. That is what I have myself attempted to do with the initial inspirations about the Middle Way I received from the Buddhist tradition, which I felt needed a very thorough reconsideration in the light of Western philosophy, psychology and neuroscience. I would like to express gratitude to Anthony Martin, Barry Daniel, Iain McGilchrist, Viryanaya Ellis and Jason Malfatto for their help as critical readers of one or more of the volumes of the series combined here prior to publication.